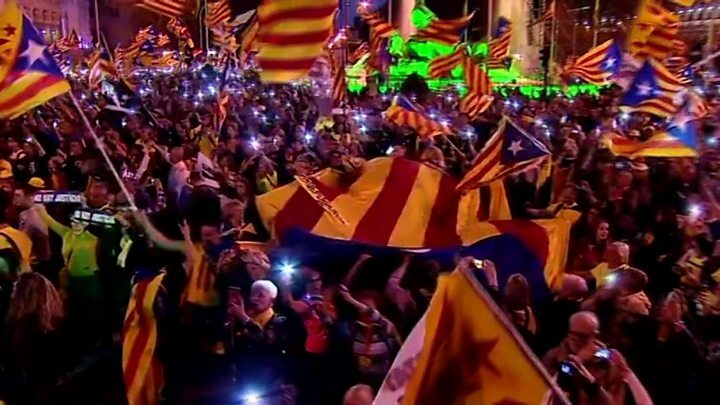 Tens of thousands of supporters of Catalan independence have rallied in Spain's capital Madrid in protest at an ongoing trial of 12 separatist leaders. Many waved Catalan flags and had placards reading "Self-determination is not a crime". The separatist leaders of Catalonia's failed 2017 independence bid face rebellion and sedition charges. Spanish authorities declared the Catalan vote illegal, and the national government imposed direct rule. Spain's 1978 constitution speaks of "the indissoluble unity of the Spanish nation".